THIS ITEM IS NOT AVAILABLE AT PRESENT. WE WILL NOT BE GETTING ANYMORE Star Wars Rogue One 20 Inch Action Figure Wave 1 Case. From the Star Wars Rogue One collection by Jakks Pacific. Star Wars Rogue One 20 Inch Action Figure Wave 1 Case. Case features 6 individually packaged figures which may include the following - 2 18 Inch Stormtroopers - 1 20 Inch K-2SO - 2 19 Inch Death Trooper - 1 18 Inch Jyn Erso. Each figure features at least 6 points of articulation. Most comes with a removable accessory. 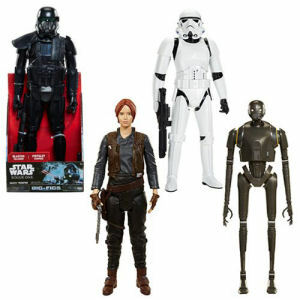 Jakks Pacific Star Wars Action Figures shipping from Canada. No Surprise Border fees or Customs!